As with several of the other books that I have listened to on audiobook, this is one that is fantastic to listen to. I am not a Spanish speaker and I would have surely mangled the names of the characters and places. A different woman narrates each character, bringing them to life. Though the four main characters–Minerva, Patria, María Teresa, and Dedé–are real, Julia Alvarez uses some facts from their lives as a framework for a story of what their lives might have been like growing up in the oppressed Dominican Republic and the events that lead up to the death of three of the four sisters. Alvarez leads on us a journey beginning in the girls’ youth as they each leave home to go to parochial school. It is at this school where some of the sisters first become political through meeting a schoolmate who’s family is murdered by Trujillo’s men. They see another schoolmate become a victim of Trujillo when she is wisked away to be one of his kept women. As the years pass, the girls each gain an education, fall in love, marry, and have children at the same time being spied upon by Trujillo’s men who lurk in their gardens. Though not all of the sisters make a conscious effort of dissension, they can’t help but be dragged in, forced to fight for the rights of their husbands and children. This is an engaging tale of four women who helped with the revolution in the Dominican Republic. 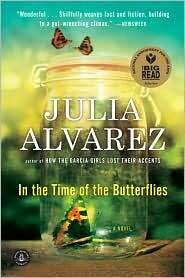 Purchase In the Time of Butterflies by Julia Alvarez from my affiliate Amazon. Ooh, thanks for all of the recommendations! Love Barbara Kingsolver and just read Water for Elephants.